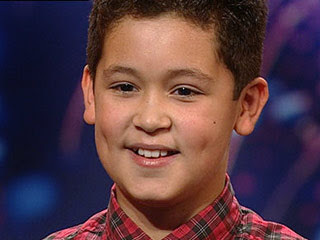 Before all the videos I've deliberately selected to show you, I just couldn't wait to show this marvelous video to you - a BGT 2009's recent audition of Shaheen Jafargholi, a 12 year old singer, singing Amy Winehouse's "Valerie." According to Shaheen, it's one of his grandpa's favourite songs. I was surprised that Simon Cowell cut the singing because it seemed for him that Shaheen was not doing it correctly with the music. A confound look seems to reveal on Shaheen's face - but not with fear. This boy really knows how to handle a tight and pressing situation like this. And it's rare for someone to be given a second chance to prove himself right on the spot! But wait till you see what happened! In the second act, Shaheen wanted to prove his worth with "Who's Loving You" by Michael Jackson. Everything really happened for a reason. Watch this video to know exactly how everything came to light. This very talented and adorable kid really has a making of a star shining so brightly for him! Great voice! Magnifico, Shaheen!